The Local Search SMB Panel features experts local search. They will explore ad discuss the strategies they use every day to help their SMB clients rank desktop and mobile search for specific geographic areas. Click the presentation title below to read the speaker bios and full description. 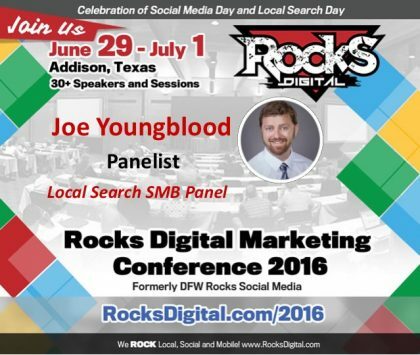 Join us at #RocksDigital 2016 in Addison, Texas for the Local Search SMB Panel, moderated by Bernadette Coleman, with panelists Saffie Farris, Ben Killmer and Joe Youngblood. Saffie Farris Brings Love of Hyperlocal to Local Search SMB Panel! Join us at #RocksDigital 2016 in Addison, Texas for the Local Search Day Panels, moderated by Bernadette Coleman, with SMB panelists Saffie Farris, Ben Killmer, Joe Youngblood and Brand panelists Greg Gifford, Rachel Morgan and Karen Platt.